← What causes interglacials? Part 1. Muller et al. have proposed an alternative explanation for the 100,000y cycle . They suggested that the driver is the change in inclination of the Earth’s orbit. This follows an 80,000 year cycle relative to the current ecliptic plane, but when projected to the invariate plane defined as the centre of mass plane of the solar system this is extended to 100,000 years. The physical process envisaged is that the interplanetary dust cloud is centerd on the invariate plane and the Earth passes through this during its orbit. Evidence from ocean sediments show a 100,000 year cycle of He3 deposits associated with cosmic dust . In effect, changes to orbital parameters of eccentricity, inclination and longitude of ascending node are all caused by the mutual gravitation of solar system planets as they orbit the Sun. Similarly all bodies in the solar system will follow such cycles including dust clouds. Let’s investigate correlations of inclination and glaciations. Figure 4 shows the data as given by  compared to the benthic foram stack. Evidence of more dust external to the earth’s orbit along the aphelion axis compared to the aehlion axis. The eccentricity of the Earth’s orbit is currently decreasing with cooling beginning in 2000 years time leading eventually to another intense Ice age after 20,000 years and lasting a further 60,000 years. A new Ice Age would be disastrous for human and animal life at large latitudes. If this theory of a variable interplanetery dust cloud is correct, then AGW will likely delay the early onset of the next ice age. To fully offset the cooling effects of a thicker dust cloud, it would be necessary to keep CO2 levels above about 700 ppm for another 70,000 years. A new possible cause of Ice Ages is proposed based on an increase in interplanetary dust for lower eccentricities of the Earth’s orbit for the last million years leading to large cooling of the Earth. 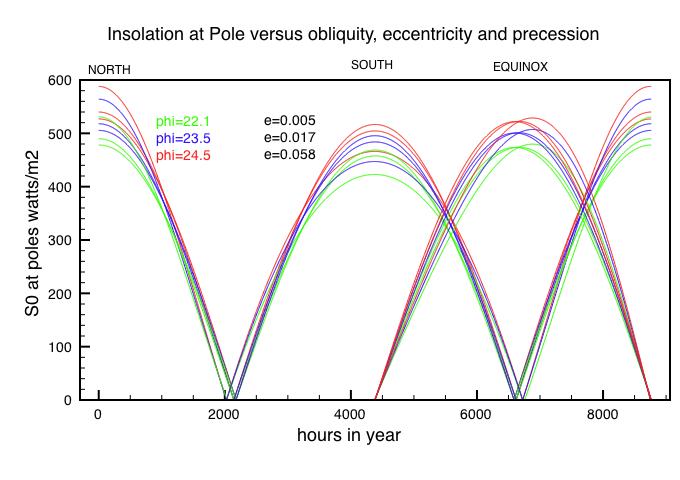 This is proposed as the cause of the switch from glaciations driven by the 43,000 year variation of insolation due to obliquity to a 100,000 eccentricity driven cycle. The next cooling cycle should begin in 2000 years time reaching a glacial minium in about 10,000 years time lasting 70,000 years. At the same time anthropogenic global warming may delay the cooling trend if induced temperature rises of 2-3 degrees occur and defer the next glaciation if CO2 levels were to stabilize at ~700 ppm for 80,000 years. This entry was posted in Climate Change, Ice Ages and tagged CO2, Ice Ages, Milankowitz.. Bookmark the permalink. 6 Responses to Part 2: The real cause of Ice Ages ? – Resonant dust clouds ? Very interesting, and worthwhile. I have quoted a bit of this stuff on my own blog – hope you do not mind. Do a plot of the -log(dust) vs Temperature in the ice core record. The dust diameter, where measured, also shows that the smaller the particle, the better the cooling effect. The dust record is certainly interesting to look at. I went looking for any evidence of a dust cloud in the TSI data but couldn’t really find any. However I now think there that the moon is the culprit rather than a resonant dust cloud. The tidal forces become at least 50% larger with increased eccentricity. This is strong enough to break up the northern ice sheets and enable insolation to do the rest.